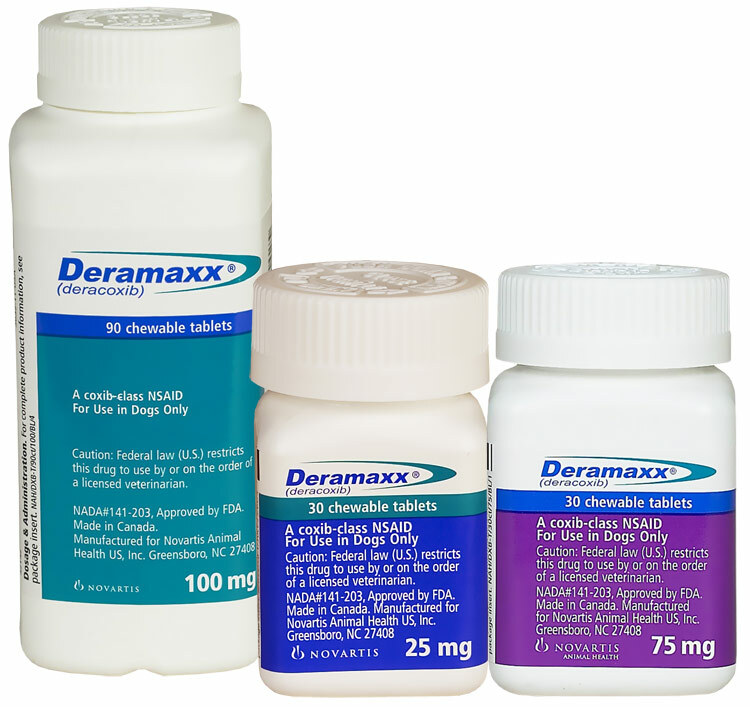 DERAMAXX (Deracoxib) is used in dogs to control pain and inflammation. Its particularly effective against osteoarthritis, a degenerative disease that affects your dogs joints. Deramaxx requires a prescription from your veterinarian. How it works: Deramaxx is a non-steroidal anti-inflammatory drug (NSAID) that belongs to the COX-2 inhibitor class of medications. Deramaxx is different from other NSAIDs because at recommended doses it blocks the COX-2 enzyme, not the COX-1 enzyme. While the COX-1 enzyme is necessary for many normal body functions, COX-2 enzymes trigger inflammation and contribute to pain in arthritic joints. View Deramaxx Drug Facts Sheet. DERAMAXX Chewable Tablets are indicated for the control of pain and inflammation associated with osteoarthritis in dogs. Osteoarthritis Pain and Inflammation: 0.45-0.91 mg/lb/day (1 to 2 mg/kg/day) as a single daily dose, as needed. Dogs needing a dose of less than 12.5 mg can only be accurately dosed through use of the 12 mg tablets, which can be broken in half to provide 6 mg. Do not attempt to accurately dose smaller dogs through the use of breaking larger tablets. Inaccurate dosing may result in adverse drug events (see Adverse Reactions, Animal Safety, and Post-Approval Experience). DERAMAXX Chewable Tablets are indicated for the control of postoperative pain and inflammation associated wih orthopedic surgery in dogs. Postoperative Orthopedic Pain and Inflammation: 1.4-1.8 mg/lb/day (3 to 4 mg/kg/day) as a single dialy dose, as needed, not to exceed 7 days of administration. Dogs needing a dose of less than 12.5 mg can only be accurately dosed through use of the 12 mg tablet, which can be broken in half to provide 6 mg. Do not attempt to accurately dose smaller dogs through the use of breaking larger tablets. Inaccurate dosing may result in adverse drug events (see Adverse Reactions, Animal Safety and Post-Approval Experience). DERAMAXX Chewable Tablets are indicated for the control of postoperative pain and inflammation associated with dental surgery in dogs. Postoperative Dental Pain and Inflammation: 0.45-0.91 mg/lb/day (1 to 2 mg/kg/day) as a single daily dose, for 3 days. The first dose should be given approximately 1 hour prior to dental surgery and subsequent doses should be given daily for up to two additional treatments. Dogs needing a dose of less than 12.5 mg can only be accurately dosed through use of the 12 mg tablet, which can be broken in half to provide 6 mg. Do not attempt to accurately dose smaller dogs through the use of breaking larger tablets. Inaccurate dosing may result in adverse drug events (see Adverse Reactions, Animal Safety, and Post-Approval Experience). Since DERAMAXX tablet bioavailability is greatest when taken with food, postprandial administration is preferable. However, DERAMAXX tablets have been shown to be effective under both fed and fasted conditions; therefore, they may be administered in the fasted state if necessary. For postoperative orthopedic and dental pain, administer DERAMAXX tablets prior to the procedure. Tablets are scored and dosage should be calculated in half-tablet increments. In clinical practice it is recommended to adjust to the individual patient dose while continuing to monitor the dog's status until a minimum effective dose has been reached. DERAMAXX tablets are a prescription non-steroidal anti-inflammatory drug (NSAID) of the coxib class. They are indicated for the control of postoperative pain and inflammation associated with orthopedic (bone) and dental surgery in dogs and for the control of pain and inflammation (soreness) associated with osteoarthritis in dogs. The tablets are flavored to make administration more convenient. What kind of results can I expect when dog takes DERAMAXX tablets for postoperative orthopedic and dental pain and inflammation? DERAMAXX tablets allow your dog to recover more comfortably by controlling pain and inflammation that follow orthopedic and dental surgery. The postoperative orthopedic pain dose is a higher dose; administration at this dose should not exceed 7 days total, including the days the patient is administered DERAMAXX while in the hospital. Control of pain and inflammation may vary from dog to dog. If DERAMAXX tablets are not given according to your veterinarian's directions, your dog's pain may return. What kind of results can I expect when my dog takes DERAMAXX tablets for pain and inflammation due to osteoarthritis? While DERAMAXX is not a cure for osteoarthritis, it can control the pain and inflammation of osteoarthritis and improve your dog's mobility. Response may vary from dog to dog but can be quite dramatic. DERAMAX tablets may need to be given on a periodic basis for the animal's lifetime. Use the lowest dose to provide adequate relief. Always consult with your veterinarian before altering the dose. What dogs should not take DERAMAXX tablets? DERAMAXX tablets should only be given to dogs. Do not use in cats. People should not take DERAMAXX tablets. Keep DERAMAXX tablets and all medication out of reach of children. Call your physician immediately if you accidentally take DERAMAXX tablets. What to discuss with your veterinarian before giving DERAMAXX tablets? How to give DERAMAXX tablets to your dog. DERAMAXX tablets should be given according to your veterinarian's instructions. Your veterunarian will tell you what amount of DERAMAXX tablets is right for your dog and for how long they should be given. Do not change the way you give DERAMAXX tablets to your dog without first speaking with your veterinarian. DERAMAXX tablets should be given by mouth and may be given with or without food, although with food is preferable. What are the possible side effects that may occur in my dog during therapy with DERAMAXX tablets? DERAMAXX tablets may cause some side effects in individual dogs, Serious side effects associated with this drug can occur with or without warning and, in some cases, result in death. The most common side effects associated with DERAMAXX therapy involve the digestive tract (vomiting, decreased appetite and diarrhea). Liver and kidney problems have also been reported. Its is important to stop the medication and contact your veterinarian immediately if you think your dog may have a medical problem or side effect while on DERAMAXX tablets. If you have additional questions about possible side effects, talk with your veterinarian or call ELANCO US INC. at 1-888-545-5973. Can DERAMAXX tablets be given with other medications? DERAMAXX tablets should not be given with other non-steroidal anti-inflammatory drugs (NSAIDs) or corticosteroids (for example, aspirin, carprofen, etodolac, prednisone). Tell your veterinarian about all medicaitons that you have given your dog in the past, and any medication that you are planning to give with DERAMAXX tablets. This should include any medications that you can get without a prescription and any dietary supplements. Your veterinarian may want to evaluate the potential for any drug interactions and to assure drug compatibility. What can I do in case my dog eats more than the prescribed amount of DERAMAXX tablets? Contact your veterinarian immediately if your dog eats more than the prescribed amount of DERAMAXX tablets. Not sure how to review a prescribed drug but this has helped both of my dogs that are on it. They are older dogs dealing with some arthritis and one with hip dysplasia. Both get up and moving with much more ease after stating this. Entirely Pets Pharmacy does in fact contact your vet to be sure this is actually prescribed for your pet and they do it very quickly. And since my dogs will be on this forever finding a better price than my vet can provide me was imperative and EP came up with the best price. Took years off my dog! My 12 yr old lab/shepherd has arthritis in his rear and a sensitive stomach. He cannot take any other NSAID without getting really sick. Deramaxx took away his pain without getting him sick. Merchant Response:Jsh, We are very glad to hear that Deramaxx helps your your dog. Both of you, take care. They took care of everything I needed to get the prescription filled. It was easy to do and they save me a lot of money. I will definitely use them again. Merchant Response:We are hard at work over here Brian. Thanks for your kind comments. Has helped our dog tremendously. Merchant Response:Hi Heather, Great to hear that Deramaxx is working wonders for your dog. This medicine has been a lifesaver for my dog, but the price just went up and I don't know how much longer I can do this. My 13 yr old Rottie has to have this medication on a daily basis. It's not cheap, but it cost way more from our vet. I was so,pleased to find it thru Entirely Pets pharmacy at such a good price. The service from contacting the vet to filling the script & getting it to me has been flawless. I am very pleased! Thank yo! Sammy will only eat this drug if I cut it in quarter pieces and hide it in a beef treat. It may be due to the nasal cancer changing his taste buds, or he is just really picky. ProsEasy to fill this order. ConsHe does seem to suffer from one of the side-effects which is dizziness. So look out for sign of that in your pet.